Lawrence Sanders's masterpiece, The First Deadly Sin, set a standard for today's novels of psychological suspense. Now, retired Captain Ed Delaney returns to a distinctly urban milieu of paranoia and impulsive violence to solve a brutal murder that shocks New York's unshockable art world. The victim is Victor Maitland. Long-considered one of the world's greatest artists, he excelled in capturing the beauty of life on canvas. In private, he destroyed whomever he pleased: his wife, his son, his mistress, his dearest friends and family. Fittingly, Maitland has paid for his sins. But in a world where self-delusion is rewarded, where greed triumphs, and where murder is just another art, who else will pay the price? ©1977 Lawrence Sanders (P)2011 Audible, Inc. I liked this story and the shorter length was about right. My only complaint is that I was awaiting one final twist that never occurred. It made sense to me if "envy" is the sin referred to. As it turned out, the "perp" seemed more to suffer from avarice. Maybe the numbering system for the sins varies. All that nonsense aside, we once again had great character development and a well-conceived plot. If you enjoyed the first, you will enjoy the second. I'll keep listening. What made the experience of listening to The Second Deadly Sin the most enjoyable? He does such a good job I forget about him. I love this series because I can see the strong images Sanders writes about. He's my current fav. In my opinion - It's as good as the first deadly sin. Compared to some of the stuff I listened to lately - It's all of five stars. It might have been written 30 + years ago - But his writing style and controversial story lines make him seem modern day. I have a hard time writing long reviews for good books. I would rather just give you my opinion and let you be the judge. The Deadly Sin series is so good I'm rereading them all. If anything, I like them even MORE the second time. If you're new to the series it follows a retired police chief Edward X. Delaney as he is drawn back into assisting the department with important murder investigations. 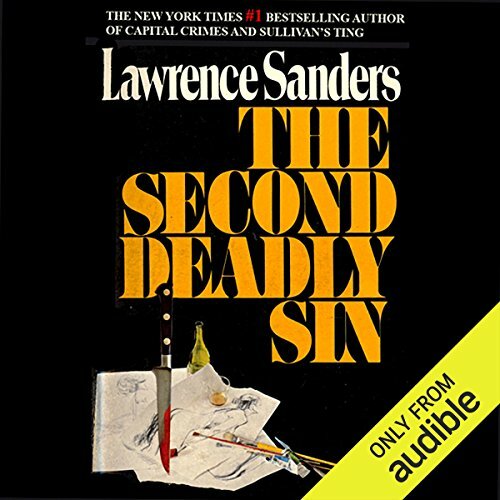 In the Second Deadly Sin (the first in the series written as a Whodunnit) a famous artist has been stabbed to death in his studio and there's almost nothing to go on. Watch as Delaney dives into the world of brutal murder, listen as he meets a cast of ruthless suspects, each craving the wealth or talent the victim had and think along with him as you try to guess who stabbed a brilliant, troubled painter in the back. The twists are great, the characters are strikingly real and the ending will grip you in its pain and its realism. The Deadly Sin series excels at taking the thriller and the mystery, embracing their cliches and opening them up, making every action, every character real. So many books in this genre are two dimensional, but not Delaney. He's a large, flawed, determined character and I promise, you'll be with him every step of the way. Love the Edward X Delany stories. This was a great read. I liked this book better than the first one and it had a better conclusion than the first book. I know I have picked up a Sanders book in the past and enjoyed it. I think this was on sale and thought I'd give it a shot. My reaction was 'blah'. The plot here is situated around a famous artist that everyone hated. The artist was murdered and Sander's protagonist, the retired captain Delaney, is asked to look into it. The story moves along ok. I was foolish enough to go to art school and understand painting very well. Sanders does not and his portrayal of an artist was kind of laughable. But I'm not judging the story based on what Sanders does not know. I think I might have enjoyed this book more if I had read the first two books in this series. The Delaney character is fully formed. So little character development is going on. I can see a heavy Ed McBain influence. Cop procedural. Conversation is dry and not as metaphysical as McBain. But it has the same lilt. Its not very suspenseful. I didn't care about the murder victim. I didn't come to know Delaney. It was all just filler. Narration: Vietor is kind of dry. I'm not going to go out of my way to find a book he has narrated in the future. What disappointed you about The Second Deadly Sin? I was waiting to be transported again into the mind of a killer, like in the first book. It didn't happen. The whole story turns around Chief Edward and his new sidekick. I am aware that the book is dated but a good crime story is timeless. This story is very forgettable. This detective story is about 35 years old, and the dated language from the late 70s waters down a good mystery with good characters, making it almost seem like a cliche. Sadly, while it might have made it a better novel when it was published, it means that it doesn't stand up as well over time. The winning piece in the package is the performance, a narrator who brings a really believable voice to Chief Edward X. Delaney - but it's not enough to bring the audiobook above a 3 out of 5. Audible is redesigning their website and I see I have 599 books in my library. Sometimes I will pick a book simply because it is recommended in a genre I like, as this one was. I wanted to like it, expected to like it. I did listen to all of this book, it has a good narrator and is creative and sound in plot development. That's the positive. My issue is, while listening to this book it occurred to me, Captain Delaney, the hero of the book is in the list of top ten of people I would not want to be stuck in an elevator with. He has a poor opinion of women, in general a good woman makes sandwiches for him and his partner. A 1950's TV marriage and view of women from a man's perspective. I can deal with that in small doses but through a whole book it wears me out and at the end I wanted to kick him hard in a special place. Not as funny as his views on women, I found Captain Delaney's attitude patronizing relative to his partner's struggle with alcoholism. I learned from this book I like my heroes with a little more vulnerability and a little less self-righteous. An edge of your seat noir. Keeps you turning pages at a rapid pace. Definitely worth the read.